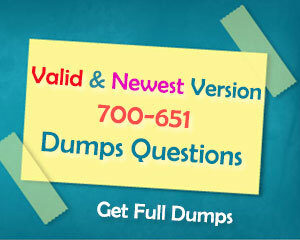 Have updated Cisco CASE 700-651 exam dumps to V9.02 with 50 real exam questions and answers. As mentioned before, exam 700-651 Cisco Collaboration Architecture Sales Essentials (CASE) is for Advanced Collaboration Architecture Specialization certification. Dumpsbase new Cisco CASE 700-651 Exam Dumps helps you complete Account Manager (AM) track for Advanced Collaboration Architecture Specialization certification. 1. How long do new workforce employees stay with a company on average? 2. Which feature of SWSS eliminates the need to repurchase software licenses? 3. How does Cisco Enterprise licensing provide a customer advantage? 4. Which options are the Cisco user-based license models? 5. Which Customer Lifecycle touch point demonstrates commitment to the business objectives of a customer by suggesting complimentary solutions? 6. For on-premises deployments, which option does Cisco recommend for a consistent one meeting experience and full interoperability’? 7. Which Cisco UCL plans support all Cisco user devices? 8. Which option is the only constant in the workplace? 9. Which design resource allows you and the customer to view examples of collaboration solutions based on scenarios products, or experiences? 10. How can you drive modernization within your customer’s existing environment? 11. Which Cisco platform provides all of the applications and integrations that other vendors have built? 12. Which Cisco product is a premised-based, cloud-managed telephone platform that targets the SMB market for partner recurring revenue? 13. Which option do all aspects of the Unified Communications and Collaboration system rely on? 14. Which SWSS offer allows customers to choose the right level of service for on-premises, cloud, and hybrid environments? 15. Which expense is typically the highest for almost all companies?